If there is still room, I'd like to throw my hat in the ring. I'm thinking of making some kind of mage. Go ahead. We've got plenty of room. Skaggi's family owns and runs the Stubborn Gruffer Tavern in Riverside but the young orc is the fourth son of a fourth son and has little chance of inheriting an ownership share. Nonetheless he put in his time as a cleaner, porter, kitchen helper, and occasional bouncer. On the side he ran with a youth gang called the River Rats, minor-league punks who engaged in more mischief than actual crime. As adulthood approaches, his older siblings have moved out, his street-mates have graduated to proper gangs (or worse, real jobs! ), and his prospects for advancement in the family business look glum. He's lonely, restless, aggressive, and looking for something, anything, to make life interesting. Coming from a relatively domesticated clan of orcs, Skaggi is leaner and more agile than the racial norm. He has grey eyes, smooth dark olive skin, and wears his long black hair in a topknot. He favours black clothing adorned with silver (or cheaper white-metal) studs or decorations. Skaggi is a bright enough lad but mentally lazy and unfocused. He can be charming and personable but also sullen and quick to anger when frustrated. He enjoys music and spends much of his free time attending performances in Allfeld. Shall I go ahead and roll for HP and cash? Do you have a preferred online roller? I've always used Invisible Castle. If you guys have a different preference I can work with that though. Haven't had time to sit down and draft up a character yet, but I should have mine done by tomorrow. Backstory: Ruby has spent most of her life moving from town to town, selling whatever oddities her family found along their travels. Redaxe Emporium was a small business, consisting of only the Redaxe family. Ruby's mother, a gnome woman named Mauriel, was the head of their little family run operation. While her father, an orc by the name of Tor, handled the heavy lifting and made sure that customer's didn't get too rowdy. Ruby usually helped her mother whenever she went searching for merchandise, but with her natural talent wielding magic she wasn't afraid to back her father up when a customer got a little to big for their breeches. This simple life continued for 20 years, before Ruby's parents decided to retire in the city of Nestora. This left Ruby the CEO and really the only employee of Redaxe Emporium. However, she wasn't about to let her family legacy go under in her lifetime. So while she gets used to running a business by herself, she's starting looking for some mercenary work to help pay the bills. Besides, who knows what kind of merch she'll find along the way. Arcane Blast: 16 yrds. 1d6 + willpower damage. Last edited by Mechmaster; 08-03-2015 at 10:32 AM. Arcane Blast (Accuracy): 16 yrds. 1d6 + willpower damage. Background: Ven'yl is descended from a very prestigious bloodline. His house was one of the few Saurian families that betrayed The Prophet and assisted the heroes of the Chaos Wars. After three hundred years they still maintain a strong presence in the city of Vorakis. Ven'yl was raised admiring the cultural dedication to weaving tech and magic to create new advances that improved the world. His fondest memories are always of the times when the Lady ruled with her golden heart. When it was time for his family to educate him, it was pretty obvious he was a perfect fit for the Twilight Academy. He excelled in his studies and after many hard years of work, graduated with a significant amount of prestige. However his happiness was short lived. Shortly after he returned to his family home, a contingent of cyborgs appeared on the premises. The Lord, recently awakened, was not happy to find that one of the most powerful families in Vorakis had a child sworn to the Lady, and they dragged his younger sister Janae away. In a brutal and most likely painful surgery, Janae was turned into a cyborg and sworn into the Lords Guard. On that day Ven'yl vowed to get his sister back, but understanding he would need more power betray the leader of Vorakis, and more power still to heal his sisters wounds, he left home, to search for information that could help him accomplish his goals. Actually, I think I'm going to go with another character. It's still going to be a mage, so I'll keep my HP and MP rolls if you want me to. 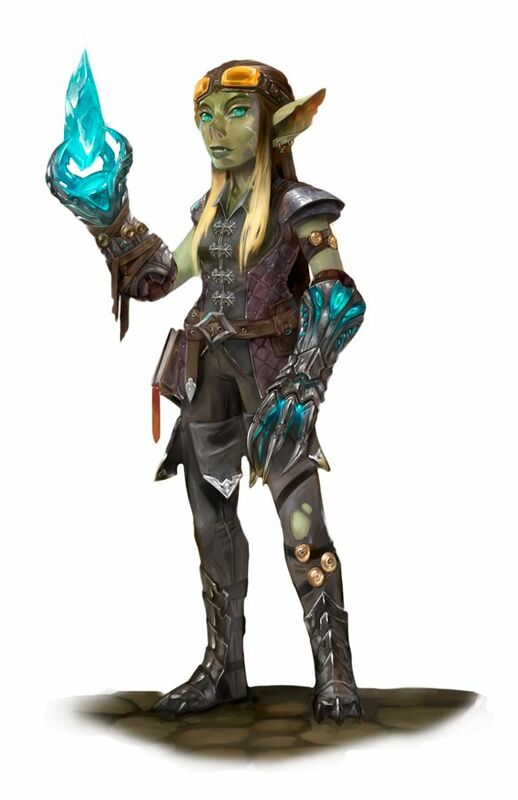 My idea is to make a Half-Orc Half-Gnome mage. Kallie stands about 5’6” tall, weighing in 135lbs. Blond hair worn in a ponytail, silver eyes from her mom’s heritage. Marks/Tattoo: Flock of seagulls starting at the bottom of her right shoulder blade and flying to the top of her left shoulder. (Black/Shadow) Left Wrist: A large leafed tree. (Black/Shadow) Right Wrist: Small Elvish Script, “Face Your Truth” (Black/Shadow) Left Shoulder: Sailing Ship (Done in limited Color).